In the last post we introduced you to Randy, our imaginary 70 kg average male runner, and we created some potential scenarios regarding his fluid and sodium losses and replacement. The biggest take home message was to listen to your body and to drink to thirst, as this has been shown again and again in the field and the lab to keep people from drinking either too little or too much. We have received tons of feedback and discussion, and as we stated in the comments to that post we are pleased that so many of you are participating in the discussion, sharing your stories, and asking relevant and insightful questions. Just as we will admit that field studies are not the perfect experiment but play an important role, it is the same with prediction equations. We can predict all we want from imaginary scenarios, and some times the equations are pretty accurate, but there is no substitute for the real thing, and many readers wanted to see more actual data and references that demonstrated why sodium ingestion is not necessary, and how both sports drinks and water will can cause a fall in sodium concentration. So while it is important to go through the exercise in the prior post, the next logical step is to look at the actual data. 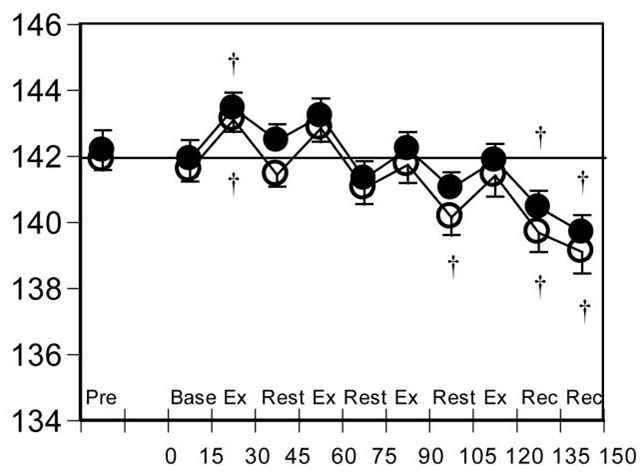 This study examined ad libitum fluid ingestion in older adults during intermittent exercise in the heat [cite source=pubmed]15870633[/cite]. Basically, they had continual access to water in one trial and Gatorade in another, and they had to cycle for 15 min and then rest for 15 min. The total time of each trial was two hours (four work/rest bouts) followed by an additional 30 min recovery period. A number of variables were measured, but we will focus on the sodium concentrations. One limitation of this study for our purposes here is that it was performed in older adults, and there is a well-documented effect of age on the thirst mechanism so that as you become older you become less sensitive to thirst. That is, your plasma osmolality rises higher before thirst kicks in. What we see is the time on the x-axis and the sodium concentration on the y-axis. The black dots represent the Gatorade trial, and the white (open) dots represent the water trial. All the subjects started with a sodium concentration of 142 mM per Liter, and in both trials the average concentration fell over time to approximately 139-140. There were no differences between the groups, and the symbols you see on the graph means that those values are significantly (statistically) different from the baseline value. So water and Gatorade ingestion produced a similar effect, and so Gatorade did not prevent a fall in sodium concentration in these subjects. 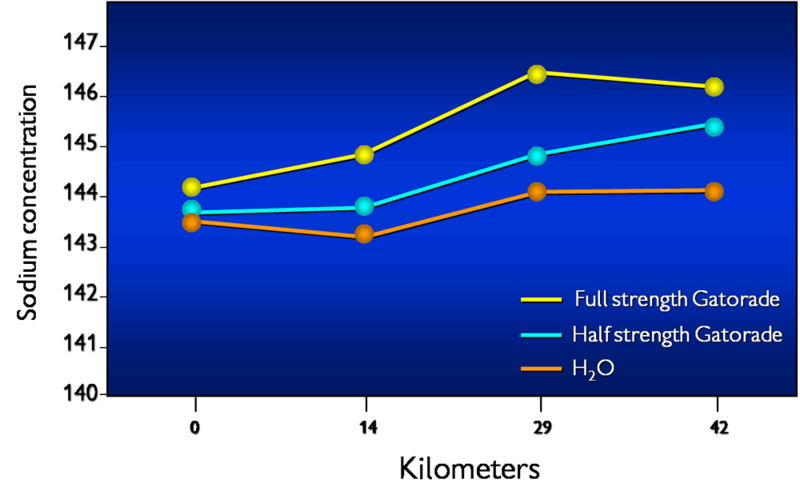 Furthermore, this woman’s data support the notion that a CES [Gatorade] is superior to water in limiting reductions in serum sodium during exercise-heat stress. 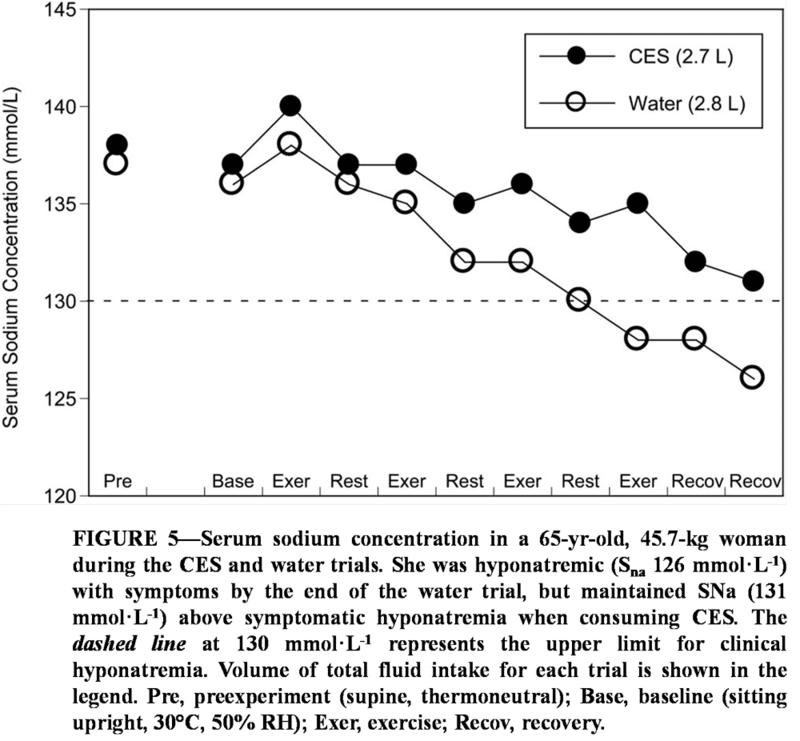 During the CES trial, this female subject consumed 2.7 L and had a final serum sodium of 131 mmol per L. Therefore, although she consumed similar amounts of CES and water, serum sodium was maintained above that of symptomatic hyponatremia during the CES trial. While the authors are entitled to their interpretation of the data, we disagree and conclude that both fluids are producing a steady fall in sodium concentration, and that the 131 value in the Gatorade trial is just marginally outside the symptomatic range (< style=”font-weight: bold;”>ingesting either water or Gatorade produced a nearly identical fall (~2-3 mmol) in the sodium concentration. In fact Jonathan tried to apply this finding to a more “real world” situation in a letter to the British Journal of Sports Medicine [cite]10.1136/bjsm.2005.022400[/cite]. In that letter he argued that since the mean finishing time of women marathoners in America is five hours, and if the ingestion of Gatorade at rates similar to those found in the study is advocated by races, coaches, scientist, etc., then there would likely be many women (and probably men, too) presenting with hyponatremia. These data demonstrate that sports drinks do not prevent this condition as their ingestion in these subjects and at these rates causes a fall in sodium concentration. So those are some of the data that support our conclusions, and we hope that helps to clarify some of our interpretation(s) and conclusions. We will still post a “wrap-up” for the series on cramping in which we will try to briefly summarize the main points but more importantly leave you with some practical advice on this complex topic!